Sunday morning is dull and grey. The wind is fierce and cold. We leave Shipyard Cottage, turning left down the lane where the coastal path runs. At the end of the lane we continue, following the path along a raised bank. There are marshes to the left and the sea is in the distance. With this biting wind, we meet few people – just a few hardy dog walkers. There are birds everywhere. We reach Stiffkey marsh, where we find a campsite and more people are out and about on the path and wading in the marshes. This area of the path is called the “Green Way” and we are now on National Trust property. The tide is in, and sections of the path are very muddy. The path takes twists and turns as it hugs the edge of the marshland. Now there are bright gorse bushes and the sun begins to peep through gaps in the clouds. There are more walkers here. 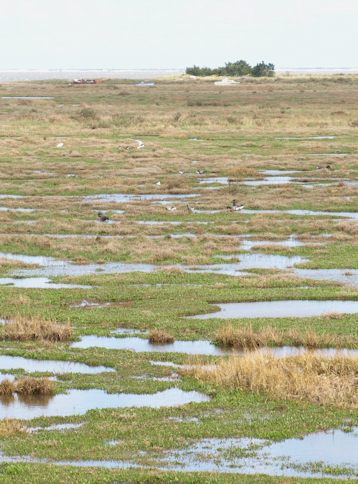 Across the marsh we see huge sea waves breaking on the sand banks that extend out from Blakeney Point. We stop and eat bananas, sitting on very soft, spongy tufts of grass. So soft, we could fall asleep here. We pass Stiffkey fen, a small lake, on the right, and reach Morston Marshes, again a National Trust Area. There is a large car park and boats everywhere. We follow the path towards Morston village and find The Anchor Inn. This wonderful pub has soft leather armchairs, free Sunday papers to read, and good, cheap food. We sink into armchairs. I have fish cakes and John has haddock in a beer batter. I drink a glass of wonderful dry cyder. Rejoining the coastal path we continue, skirting the marshes, until we reach the village of Blakeney. Lots of people are out, despite the cold wind. We sit on a bench overlooking Blakeney Hotel and the small harbour, while I adjust my blister plasters. Then the final stretch of our walk heads out along the raised sea wall, out towards the distant sea. There is no shelter and the wind tugs at us. Other walkers are out, most with dogs. We follow the curve of the sea wall, separating salt marsh on our left from freshwater marshes on our right. The sun comes out and the water gleams. Every inch of land appears to be covered in birds. As we round the corner, we see Cley-Next-the-Sea in the distance. There are fields of rippling reeds and a large windmill behind the reed beds. 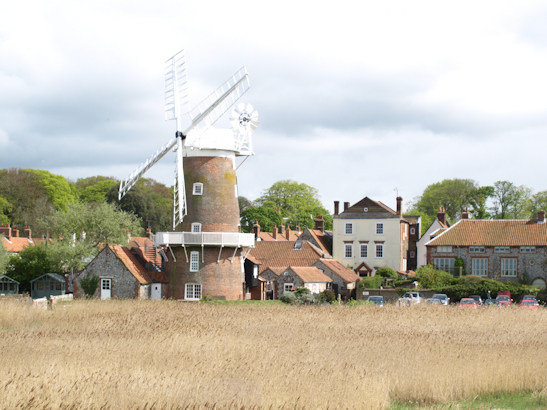 The view of Cley, in the shifting sunlight, is lovely. While John braces me against the wind, I take far too many photos of the windmill. The coastal path leads into the village of Cley, where we end this part of the walk. After a very short wait at the bus stop, we catch the wonderful Coast Hopper bus – back to Wells. This entry was posted in 02 Norfolk and tagged blakeney point, britain, british, Cley, Cley-Next-the-Sea, coast, coastal, england, hiking, marsh, Morston, Norfolk Coastal Path, path, UK, walk, walker, walking, Wells, Wells-Next-the-Sea. Bookmark the permalink. I’m planning on doing this and other sections of the trail next week and am enjoying reading your personal account. Do you think it would be manageable in January? So much talk of marshes is slightly disconcerting! Thank you. Hi Rebecca, I hope you enjoy your walking next week. If I remember correctly (and it seems a long time since I did this section) the official coastal path in this part of Norfolk is well marked and it should be OK – even in January! Life gets a bit more difficult when you try and walk the rest of the coastline.